Flower Essences are electrical in nature. Theirs is not a realm of language, but until you actually work with Flower Essences, words are the only way to explain them. Throughout this web site I try to stuff enormous realities into the limited framework of words, and I try to indicate the wonder of Flower Essences from the limited viewpoint of my own experiences. Please forgive me for the shortcomings of my word and story choices. My language choices are the best I can do with the words I know. My story choices are attempts to indicate a shared spiritual reality that all of us experience differently, a reality so much bigger than I can contain. My choices are not an attempt to push anyone towards any spiritual belief or suggest Flower Essences are only for those who view the world the way I do. My intention is never to divide us from each other with polarizing ideas but always to expand our experience of our oneness in a glorious Flower filled world. Green Hope Farm Flower Essence Vocabulary 101: What am I trying to convey with the language I use to describe Flower Essences? There is much about Flower Essences that is paradoxical. Language is not the only hurdle! For example, Green Hope Farm Flower Essences are made with Flowers but do not actually contain Flowers. Instead they are the electrical wisdom of the Flowers preserved in a decoction of Red Shiso, a member of the mint family. Every Flower has a specific healing, strengthening and balancing electrical pattern unique to that species of Flower. When this electrical wisdom is transferred into our Red Shiso stabilizer, it becomes a Flower Essence. "Each Flower Essence is a tool that can lead us towards greater health and well being by offering us the Flower's healing wisdom about specific emotional, mental, physical and spiritual concerns." Each Flower Essence is a tool that can lead us towards greater health and well being by offering us the Flower's healing wisdom about specific emotional, mental, physical and spiritual concerns. Each Flower Essence also can help us to remember our true eternal identity as one with God, an irreplaceable and unique part of all that is. Why do Flowers have Wisdom to Share? To continue to live and prosper, each Flower in creation must solve the specific problems it confronts in its ecosystem. 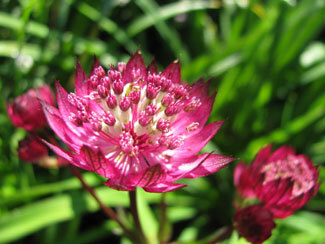 For example, a desert Flower from the American southwest must overcome the challenges of extremes of temperature and infrequent and sparse precipitation, whereas a Flower from Green Hope Farm in northern New Hampshire must tackle the challenges of dramatic seasonal temperature fluctuations and fierce winters. The solutions Flowers develop in response to the problems they face become part of the Flower's architecture and growing habits as well as its energetic vibration. This vibration is the unique electrical pattern of each Flower. "The solutions Flowers develop in response to the problems they face become part of the Flower's architecture and growing habits as well as its energetic vibration. This vibration is the unique electrical pattern of each Flower." 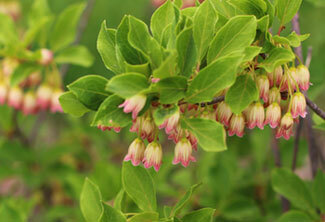 Flowering plants seek to evolve for other reasons besides survival. They seek to be the most sublime expression of their divinity. Flowers are the highest vibrational expression of a plant and reflect the plant's efforts to be its unique divine self in a sea of divinity. So why does this help us with our problems? As energetic as well as physical beings, we interact with the world energetically. We read the energetics of our world all day long in a search for good energetic information that can help us feel our best. We know when a place feels harmonious, and we know when someone doesn't click with us. We know this without language, and we know this without physical contact. We know this because we use our electrical systems to read our world energetically every moment of every day. When we experience the energetics of a Flower, we read and benefit from its problem solving vibration even as we enjoy its beauty. Flower Essences are simply a more permanent form of this same problem solving data. Flower Essences make it possible for us to experience the healing vibrational information of a Flower even when the Flower is not blooming in our world. Our electrical systems read the data of a Flower Essence much as we might read a road map. If our electrical systems recognize that a Flower Essence offers a problem solving technique for a problem we have, our electrical systems will copy and use this electrical information to solve our problems. There is no involuntary chemical interaction that may lead to unpleasant side effects. Instead, our electrical systems use the same discerning skills they have always used to decide whether the Flower Essence is something useful or something we don't need. Because Flower Essences offer their immense healing gifts energetically, there are none of the drawbacks of chemical medicine. They are completely safe to work with whether you use them alone or alongside other healing modalities. There is nothing physical about a Flower Essence so you cannot take too much or have a chemical reaction to a Flower Essence. They are electrical information that your electrical system knows how to read and learn from. "There is nothing physical about a Flower Essence so you cannot take too much or have a chemical reaction to a Flower Essence. They are electrical information that your electrical system knows how to read and learn from." Children and animals are wonderful teachers when it comes to Flower Essences. They recognize the gifts of Flower Essences and make the most of their wisdom in a matter of fact way. They show us how easy it is to make the paradigm shift from a chemical model of reality to an energetic one in which we understand that Flowers and Flower Essences really can make an enormous difference to our health and well-being. Looking at ourselves from an energetic model, we are not just physical forms, but also complex energetic systems of mental, emotional, spiritual and physical energetic patterns flowing harmoniously or experiencing various electrical tangles. There is a Flower that has successfully tackled just about every tangle we could possibly experience. When we work with Flower Essences made from these Flowers, the information offered helps us untangle our energetic logjams, be they emotional, mental, spiritual or physical. This frees us to experience greater health and wellbeing as well as a clearer sense of our divinity. "One untangling at a time, Flower Essences take us to the truth that we are one with God, and on the way to this moment of self realization we get to experience more joy, more happiness and better health, all thanks to these gentle teachers, Flower Essences." Long-term mental, emotional and spiritual tangles impede the movement of electrical energy in our bodies, and eventually this kind of diminished flow impacts our physical body. This makes Flower Essences a particularly effective healing tool because they work to unravel electrical tangles before they cause physical problems. What are these tangles l keep talking about? In a word, these tangles are illusions. And in my experience, most of these illusions boil down to some variation on the false idea that we don't deserve God's love and exist separately from God and this love. One untangling at a time, Flower Essences take us to the truth that we are one with God, and on the way to this moment of self realization we get to experience more joy, more happiness and better health, all thanks to these gentle teachers, Flower Essences. Wake Up Time: How do Flower Essences break up our illusions and why are they such an essential tool at this time on Earth? Flowers want us to recognize their gifts! Plants look like their healing purposes. 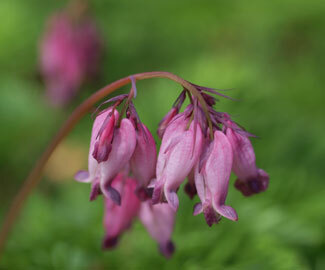 Here are some examples of Flowers that demonstrate the specifics of their wisdom via their appearance. 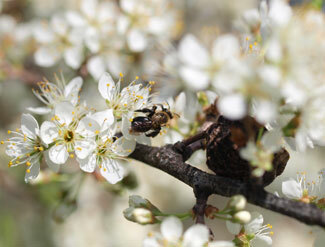 We make our Flower Essences from the organic Flowers of fruit trees, shrubs, annuals, perennials, herbs and vegetables we grow here at Green Hope Farm. Everything is done in loving cooperation with the Angels and Elementals who partner with us at the farm. Since 1986 we have been working with these beloved friends to create gardens of great light, healing power and beauty. 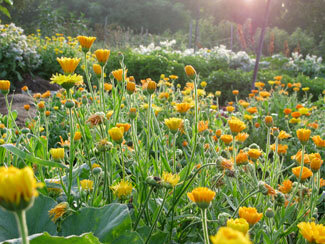 The high vibrations of the gardens result in Flowers that have particularly high vibrations. This is intentional since these higher vibration Flowers make for better, higher vibration Flower Essences that in turn are better able to guide all of us to an experience of greater light and well-being. "Transferring the healing electrical pattern of the Flowers from the Flower blossoms into the more durable long lasting form of a Flower Essence makes it possible for all of us to learn from the healing wisdom of the Flowers even when we are not in the presence of the Flower." Our partners from the Angelic kingdom hold the divine plan for each Flower in creation and help us grow Flowers in alignment with their purposes. 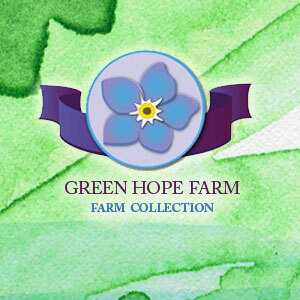 They also help us stay aligned with the divine plan for Green Hope Farm and its mission with Flower Essences. Our partners from the Elemental kingdom translate the divine plan into actual form. If Angels are the architects of form, Elementals are the builders. 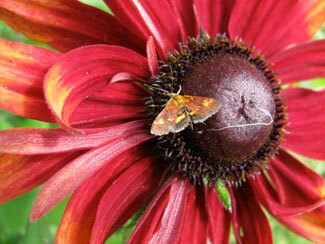 They are key advisors in all aspects of actually growing the Flowers. Elementals are also essential to the process of making Flower Essences as they transfer the electrical pattern of the Flowers from the Flowers into the Flower Essences. Without Angels and Elementals there are no Flower Essences. Transferring the healing electrical pattern of the Flowers from the Flower blossoms into the more durable long lasting form of a Flower Essence makes it possible for all of us to learn from the healing wisdom of the Flowers even when we are not in the presence of the Flower. 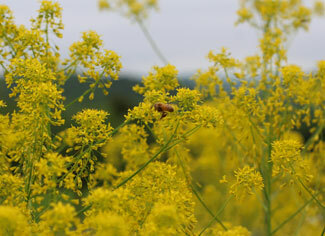 Sometimes the Angels and Elementals send those of us at the farm to other parts of the world to make Flower Essences. Other places on Earth hold specific wisdom that can be accessed through local Flowers. When we make Flower Essences in other places these Essences give all of us the opportunity to experience the healing energies of these places and their Flowers whether we can travel there or not. Wherever we go, we work with the local Angels and Elementals. This cooperative work, both here and elsewhere, is an immense joy. While once the Angels and Elementals accepted our reluctance to be equal partners with them, things have changed! In the beginning and end of the document and in the conversation with the overlighting Angel of Omey Island, the Angels and Elementals of Ireland have some interesting things to say! We are deeply grateful to Red Shiso, Perilla frutescens for its preservative and healing energies. Red Shiso is the Japanese herb we have used as the stabilizer for all of our Flower Essences since 1994. Red Shiso is used extensively in Japan for food preservation especially with umeboshi plums. In Japanese, shiso means purple leaf. 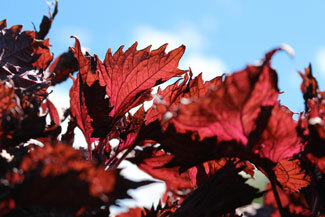 A robust member of the mint family, Red Shiso grows into lush three-foot high plants of deep magenta color. Besides contributing flavor and a distinctive red color, Red Shiso contains perilla aldehyde, a preservative documented to have a thousand times the strength of synthetic food preservatives. "More importantly, the life force of the decoction was so vibrant, clear and strong that we knew we finally had a stabilizer with as high a vibration as the Flower Essences themselves. It was a match made in heaven." Because the life force energy in Flower Essences can lead to bacterial growth, Red Shiso, with its active ingredient perilla aldehyde, is a wonderful and necessary stabilizer. 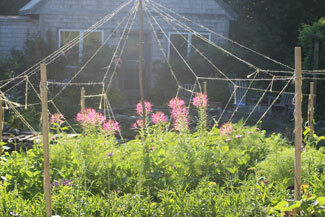 • Each year the mandala for our field of Red Shiso is different. 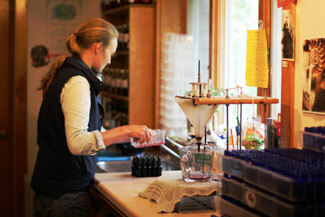 Each energy matrix brings sparkling life force energy to the farm and our Flower Essences. • Post- harvest, Red Shiso's bright and shining light fills the rafters of our Red Shiso building with a beautiful energy. Each dried leaf used in the decoction is carefully hand selected. Only the deepest purple leaves are used in our stabilizer. • We make our Red Shiso decoction with our artesian well water mixed with a small percentage of white vinegar. With Flower Essences in Red Shiso you get three vibrational boosts at once. • Our Flower Essences are well stabilized by the Red Shiso, allowing them to offer their complete healing vibrations. • The Red Shiso matrix in which our Flower Essences are stabilized amplifies the healing energies of our Flower Essences. • The Red Shiso offers us its own healing wisdom about comfortably holding more light energy and vibrating at a higher rate of speed. It was not until we mixed the first batch of Red Shiso in 1994 that we began to grasp the full glory of this stabilizer. Not only was the decoction a lovely pink color, but its taste was pleasant enough that even our taste-testing teenagers found it palatable. More importantly, the life force of the decoction was so vibrant, clear and strong that we knew we finally had a stabilizer with as high a vibration as the Flower Essences themselves. It was a match made in heaven. • Our Flower Essences are stock concentrations. This means you can use our Flower Essence just as you receive them or you can order our Red Shiso stabilizer in 2 oz. bottles to make dosage bottles. You can also make custom mixes of the Flower Essences of your choice combined with Red Shiso as your stabilizer. Making a Custom Mix: Want to know more about making a custom mix? The Drama behind Red Shiso: Our friendship with Red Shiso began in a dramatic way. Read all about it! Every Flower Essence offers much healing wisdom. Choosing a group of Flower Essences can be a relaxed process because almost all Flower Essences will serve you in some way. This means you can select Flower Essences to work with knowing that virtually every Flower Essence will help you and none will hurt you. "When specific collections of Flower Essences or specific Flower Essences grab your attention, this is because they resonate with something within you that would benefit from their healing vibrations." I encourage you to trust your intuitive sense of which Flower Essences are calling to you. Sitting quietly and anchoring your awareness in your heart can enhance this intuitive listening. Your heart is your most direct physical link to your divinity. As the Angels describe it, our hearts are the outposts of our divinity in our physical bodies. This makes our hearts the best place to go for wise inner guidance. As you look at the photographs of the Flowers, trust which Flower blossoms call to you. Flowers are meant to attract your attention when they hold a vibration that will serve your energy system. Additionally, if you love a specific Flower consider this a nudge to work with its Flower Essence! When specific collections of Flower Essences or specific Flower Essences grab your attention, this is because they resonate with something within you that would benefit from their healing vibrations. We have created tools on this site to help you find what you are looking for. Explore our new Essence Finder! Flowers like to befriend us and will often connect with us through dreams or synchronicities. The imaginative ways Flowers call us to their Essences is part of the fun! What are I AM Affirmations? 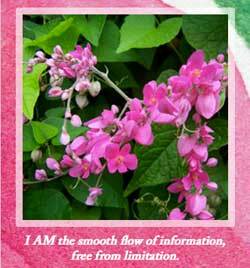 Each individual Flower Essence description is followed by an I AM affirmation. These affirmations are another way to decide if an Essence would be a helpful tool for you. Our planet is evolving and so are we. Our electrical systems are in a state of significant positive change and often need the support that Flower Essences offer to make this a smooth process. If you feel prompted to work with a large group of Flower Essences, trust this inner sense of your situation. Your electrical system is able to handle the positive data of many Flower Essences with ease and grace. Often this is the very information your electrical systems have been searching for. Why does some Flower Essence literature insist I should restrict the number of Essences I work with? Here are my thoughts on this topic! If you want to dive deeper and read about our Additional Flower Essences that are not included in the Finder, or if you're looking for something to help you with a very specific concern, take a look at some of the useful Essence Lists we've included below (pdf files). We are in the Green Hope Farm office Monday through Thursday from 8:30 - 4:00 (EST). 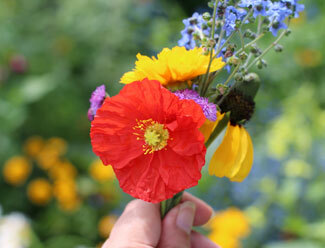 We would love to email with you to provide recommendations or guidance in your Flower Essence selection. If we are out in the gardens or away from our desks for any reason, we will email you back as soon as we can! Remember, Flower Essences are much easier on your system than conventional remedies. WHY? Because they are information not chemical! No matter which method you use for choosing Flower Essences, there is a great deal of latitude for experimentation. Relax! Practice with a trusting and playful attitude. This process is not a test. You can't do this wrong. In addition, tuning into your energy system brings its own rewards. It may seem tedious at times, but it builds momentum for you to find your way to complete conscious reunion with your God self. 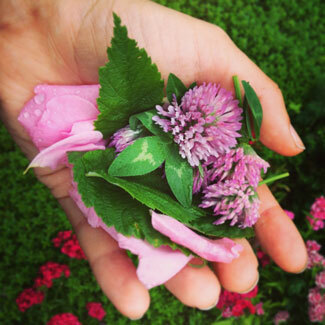 Flower Essences can provide helpful healing information for most any challenge or difficulty. They offer support whenever you feel energetically out of balance. They bring solutions to chronic complaints as well as to situations of sudden trauma or illness. Flower Essences are wonderful support for the mundane ups and downs of life as well as the deep soul work each of us embarks on during our journey through life. Think of them as road maps for whenever you would like support in any way. You can work with your Flower Essences in a morning and night routine or you can use them sporadically. Some days you may take them frequently and other days not at all. You may select a group of Flower Essences to work with for a period of days or weeks or you may want to start afresh each day in your selection process, rethinking your choices based on what is going on that day. "Think of them as roadmaps of support. Trust your own heart." My own experience is that your heart will prompt you to take Essences how and when you need them. It is always wise to trust one's heart, but never more so than when working with these safe and gentle friends. 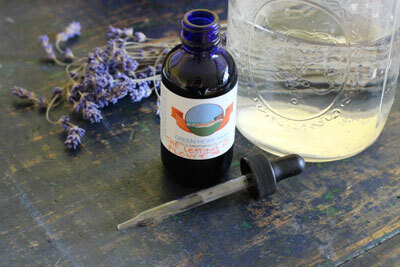 If you already work with other healing systems, Flower Essences will not interfere. In fact, they can help you better integrate the benefits of these other healing modalities. 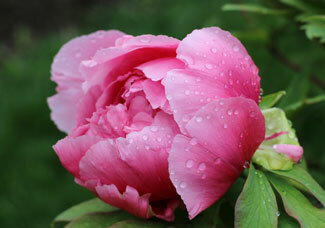 Flower Essences are marvelous gifts offering helpful information for your electrical system. They are NOT chemical and therefore will not alter the chemistry of your body. When a Flower Essence description is linked to a specific part of the body or a physical issue, we are not saying that the Flower Essence has the volition to fix anything. The Flower Essence will offer your electrical system potentially helpful information about this issue or area of your body which you and your wise electrical system will use to solve this issue or not. All will be in alignment with the divine plan for you. "Flower Essences are information only. They are beautiful road maps for your healing journey. They will not do anything to you! You and your divinity remain in the driver's seat!" Flower Essences do not dilute down like a chemical remedy. This is because they are electrical information not a substance. This means a little bit of a Flower Essence holds the same information as a lot. You can work with just a few drops of a Flower Essence and receive its complete healing information. "Remember that the amount you take or the frequency with which you use the Essence are never something you can do wrong. Because Flower Essences are data not chemical you can never take too much." Frequency is more important than the amount. Frequent exposures to the wisdom of a Flower Essence help your electrical system to learn and copy this information and make it your own wisdom. This is one reason why many of us at the farm put our daily Flower Essences in water. With Flower Essences in water we get a reminder of the energetic wisdom of our Flower Essences with each sip. Once your system has learned the healing pattern of a Flower Essence, you usually do not need the Flower Essence anymore. However, a Flower Essence can be useful again when other issues crop up that the Flower Essence can now resolve. For example, you may have used our combination Flower Essence mix Anxiety to help with a certain kind of anxiety, and your electrical system will have used the information in the Anxiety mix to solve this specific issue. If you experience another kind of anxiety, the mix will come in handy again for different reasons. Additionally, you may need to work with an Essence again in situations of stress as our electrical systems don't always remember what they know when they are under stress. Remember that the amount you take or the frequency with which you use the Essence are never something you can do wrong. Because Flower Essences are data not chemical you can never take too much. There are so many ways to use Flower Essences. While I discuss a couple of different methods, don't let that stop you from doing something entirely different! As electrical information, Flower Essences are read by your electrical system, a system that extends out from your actual physical body. What your expansive electrical field means in terms of Flower Essences is that there are many excellent ways to give your electrical system the road map of Flower Essences. • You can put drops of Essences in a glass of tap water or juice to sip. • Distilled water will not hold the charge of Flower Essences and is not a good choice of liquid. • You can drink them in tea or coffee. • You can put them in the bath. • You can rub them on your skin. • You can put them in food or directly in your mouth. • You can spritz the rooms where you live or work or spritz yourself with Essences mixed with tap water. How Do Essences Know Where to Go in my System? Here is more information about how Essences work and why our electrical systems are so interested in their data. 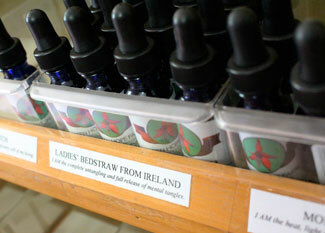 We work hard to maintain the vibrational integrity of the Flower Essences as they travel the world to you. We bottle our Essences in lead free, cobalt blue bottles. The vibration of the bottles is very protective. We also ask the Green Hope Farm Angels and Elementals to protect your Essences until they reach you. Then the baton passes to you and the Angels and Elementals you work with. Here is some information about keeping your Flower Essences vibrant and strong. When well cared for, our Flower Essences will hold their electrical information for at least a year. You can help keep them protected by storing them out of high traffic areas in your home. If your Flower Essences are kept in highly populated spots, they can get drained of information by all the people and animals energetically tapping into their wisdom. If you put them in a sheltered spot, they will hold their vibrational wisdom longer. By sheltered spot, I don't mean out of sight completely. Flower Essences love to be used! They don't want you to tuck them away and never think about them again! Try not to touch the dropper to your mouth or anything else as this introduces other vibrations into the Flower Essence. If you accidently touch the dropper to something else, rinse it under cold water for several seconds before putting it back in the bottle. Flower Essence Care Article: Here's more information about caring for your Flower Essences including information about the Angels and Elementals who will help you keep your Flower Essences vibrant. Here's an explanation of the vocabulary I use to describe our Flower Essences as well as a description of the subtle bodies of our electrical system and my thoughts on the topic of Ascension or self realization. In brief, what are the chakras of the human body and which Flower Essences can best support in their health and well-being? Why do we give an I AM affirmation with each Flower Essence definition? How do these support you? How does what a Flower looks like reveal its healing purposes and why? Here some information about the many spiritual teachers happy to support you with all aspects of your work with Flower Essences and why you deserve this support! It is time for Humanity to co-create a new Earth with the Angels and Elementals. The Angels and Elementals of Ireland have a lot to say in their longer description of the Irish Flower Essence collection including a lot to say about Land Clearing. They voice their thoughts in the beginning and end of this document and also in the description of our Omey Island Flower Essence. Taking a look at how Essences can support us through the trials of early adulthood. Here is what the Angels had to say about their new Essence mix for those dealing with the challenges of Lyme disease. Child oriented Flower Essence descriptions for some of the Green Hope Farm Flower Essences most helpful for children or the child within us. Read the long definitions of our Animal Wellness Flower Essences. Animals and Flower Essences are a particularly good match. Here's our thoughts on this. Our work with animals is central to our mission. Read all about the collection we created to serve the animals, and as it turned out, their people too! How did our creation of the Animal Wellness Collection happen? It's a funny story and a typical tale of Angel synchronicity! We will happily share our Animal Wellness brochure with you as a paper document. Here's a pdf version if you'd like to see this information right now. What does it mean to be empathic and how can Flower Essences help? Read about any of our Flower Essences by clicking on the links below. Cape Fuschia "Moonraker" Phygelius "Moonraker"
Pink Mulla Mulla Ptilotus Exaltatus "Joey"
Purple Orchid from Scotland I AM the swift and steady accomplishment of my goals.